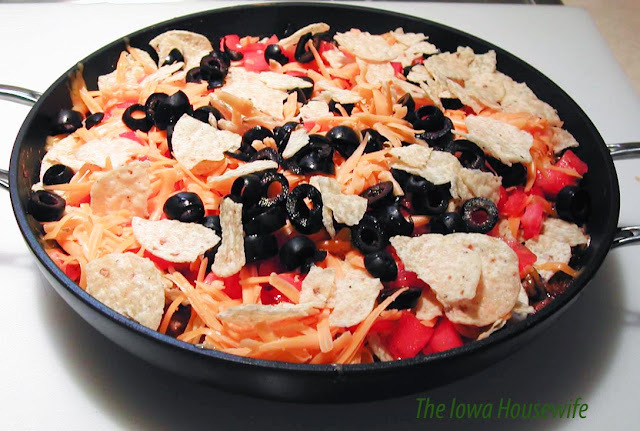 The Taste of Home Casserole cookbook has some good casserole recipes. This one, is one I debated about making as neither Lyle or I are fond of Mexican food. Bettie however is, so thought I would try it. I must say that this might change my mind. All of us enjoyed it and it warmed up nicely for lunch the next day. I used a can of chopped green chilies, and it could have stood a little more heat. The recipe calls for 2 cans of refried beans, and I used only one. Really this is plenty. Even if you like refried beans, I would try adding one can at a time and checking it before adding the second can. I grated the cheese myself. The grated in the bags, has flour added so that it doesn’t stick together. In a large skillet, cook the beef, onions and celery over medium heat until meat is no longer pink; drain. Stir in the taco seasoning mix, water, beans and green chilies if using. Pour into a greased 2 ½ quart baking dish. Bake uncovered, at 350° for 30 minutes or until heated through. Top with cheese, green onions, tomato, olives and chips. I used the same pan to brown hamburger and heat in oven. One less dish to wash. Thanks for your tips on this one. Sounds good! We love Mexican food so will give it a try. I make my own taco seasoning as the packets are very high in sodium. I've been known to make my own refried beans when I don't have a can in the house. Have a beautiful day!